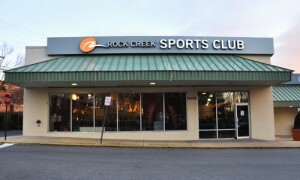 Rock Creek Sports Club is an independently-owned fitness center located in Silver Spring, MD. We’re a friendly, neighborhood gym that prides itself on giving members a personalized experience. Among other distinctions, Bethesda Magazine voted us one of the best places to work out in the DC area. We have a great facility in Rock Creek Shopping Center, next door to the Parkway Deli. You’ll find everything you need here – work out on your own, book a session with one of our personal trainers, or check out our wide variety of classes. Whether you choose to work out in our sun-filled upper level, with its high ceilings, exposed beams and open atmosphere, or our no-nonsense lower level reminiscent of an old-school boxing gym, you’ll look forward to walking through our doors every day. We take your fitness personally, and we’re passionate about providing you with the tools you need to become stronger, faster, healthier and more confident in your appearance and your abilities. Whether you’re an experienced professional athlete or you’re just starting to take an interest in your physical fitness, you’ll find a home here. We look forward to welcoming you.